Dill (Anethum graveoles) is an attractive annual herb. It has tall, elegant branches with small clusters of yellow flowers filled with aromatic seeds that are used to flavor salads, vinegar, soups, stews, and many chicken, lamb and fish dishes. 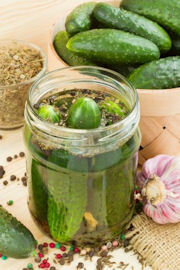 It is also used in cottage cheese and home-baked breads and pickles. The seeds should germinate in 10-15 days and mature in 70 days. The quickest way to get started is to use transplants from garden center. Starting by transplants: You can purchase young potted plants at the garden center or you can buy them through a catalog. Then repot your plants into a larger pot that is at least 6" - preferably terracotta/clay. You must repot them within a week to prevent plants becoming root-bound, resulting stunted growth. Watering: Water by thoroughly drenching plants, let water drain out and empty. Do not leave plants standing in water because this will cause the roots to rot. Let soil dry out between watering. Lighting: Give the plant good light, a sunny south or west-facing window that gets a minimum of six hours of sun a day, or 12 hours of artificial light. Care: Plant will grow taller inside so it necessary for you to stake the plant when it gets 10 inches high. Harvesting: Separate the seeds from heads of the lacy foliage by shaking them loose into a paper bag. You can cut and use the dill leaves at any time.